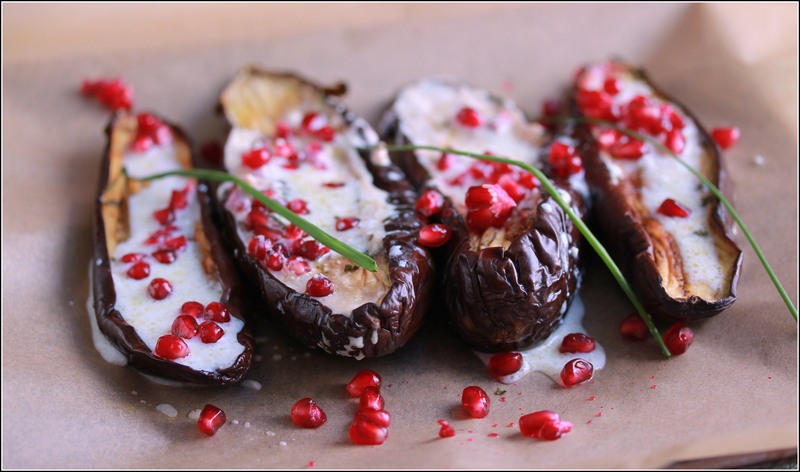 This Roasted Eggplant with Buttermilk Sauce and Pomegranate is a blend of elegance and simplicity, remarkable taste and contrasting textures. After a walk on a bitter cold morning, my thoughts oscillated between cold weather images on screen—think Zhivago emerging from the mountains to find Lara in Yuriatin—and tropical weather treats. Taking comfort in the fact that I was not nearly as cold as dear Dr. Zhivago, I found myself searching for hot weather fantasies. I came upon this recipe in Plenty by Yotam Ottolenghi, an Israeli chef and cookbook author now based in London. His recipes are all imbued with light and sunshine. 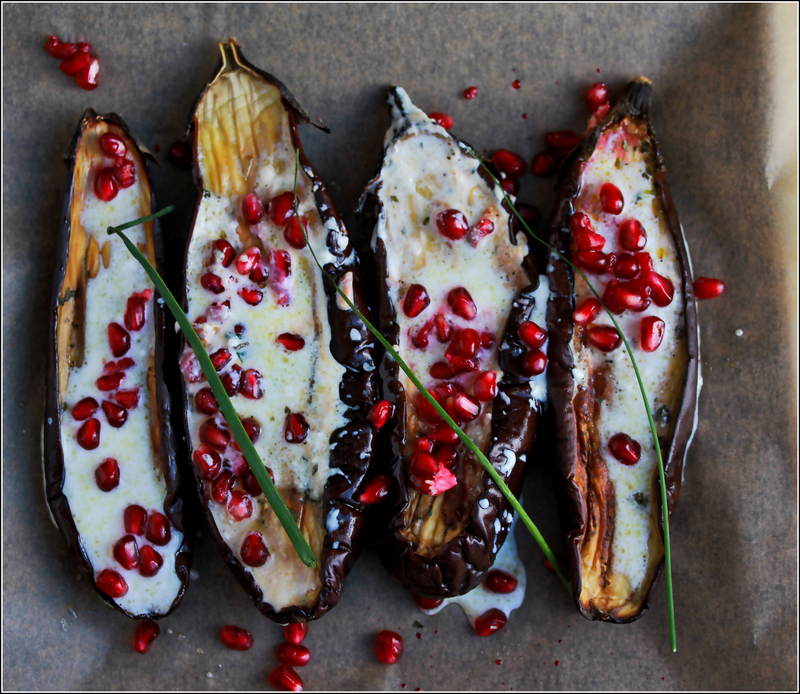 In this dish, the eggplant is roasted then topped with a tangy buttermilk sauce. Garnished with sweet crimson pomegranate seeds and fresh herbs, it makes a dish as beautiful as it is delicious. Don’t be frightened off by the need for fresh pomegranate seeds. Removing them from the fruit is not as difficult as it might appear and certainly worth the work. (I’ve included a link to a how-to video in the recipe notes.) We ate ours by the fire with dear friends Saturday evening. Accompanied by whole wheat pita bread, Onion Soup and a steamy bowl of rice, this meal takes the chill out of the coldest of days. 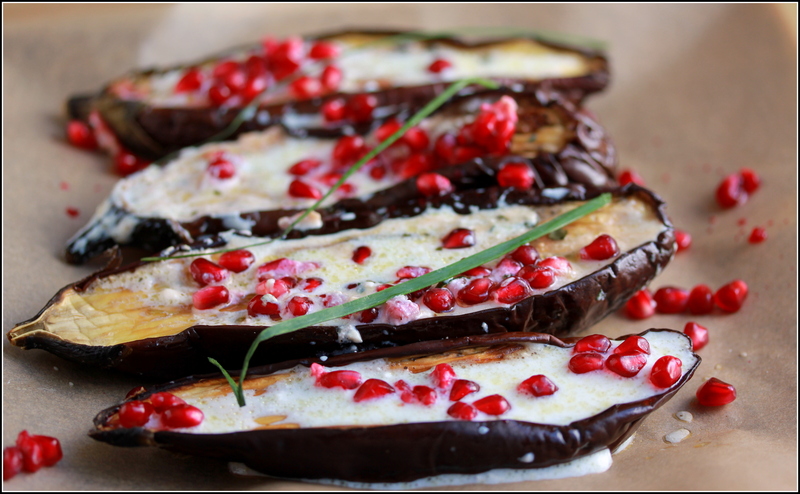 Preheat the oven to 400 degrees F. Cut the eggplants in half lengthways, cutting straight through the green stalk. Leave the stalk intact. Use a small sharp knife to make three or four parallel incisions in the cut side of each eggplant half, without cutting through to the skin. Repeat at a 45-degree angle to get diamond-shaped patterns. Click here to watch a video on how to remove seeds from a pomegranate. Serve with steamed rice and Spicy Sweet Potato Soup or Roasted Onion Soup.